Home » Summer Positions » Admin Intern » What does an Intern do? Here is a sample distribution of the time commitment. Able to model Christian character, compassion, and service. Must have transportation and be able to travel to and from church at necessary times. Skilled or fast learner in Microsoft Office, Apple iLife, Google Docs. Previous ministry experience preferred, but not required. Can provide own laptop computer. Has a drivers license and can drive in Boston. Interns should be available at least 2 times a week. 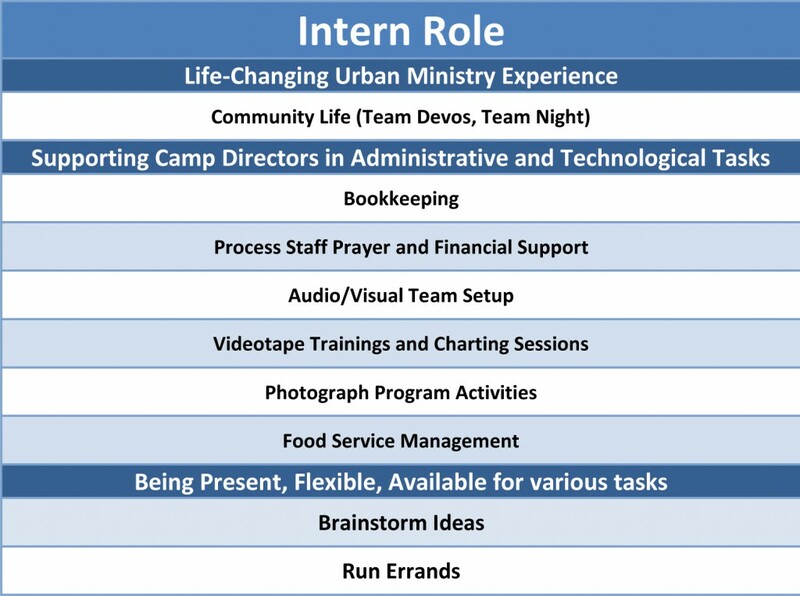 Interns are asked to give 15-40 hours per week at the camp site, Monday through Friday. Hours may vary to best suit the program and applicant. Interns will live at home and travel to the camp-site each day. Although on-site time is to be determined, Interns are encouraged to join morning team devotions at 7:30AM and debriefing from 4:00-5:30PM. On Thursdays, Interns will join the team for dinner and stay for Team Night until 10:30PM. Interns are also required to attend one day of orientation, one week of pre-camp training, as well as a staff overnight trip.